The emergency room is a space that’s inherently loaded with extreme emotion—the drama of life plays out here on a daily basis, constantly reminding us of our own mortality. It’s a place that nobody ever wants to go, especially when it’s an unexpected visit in the middle of the night. 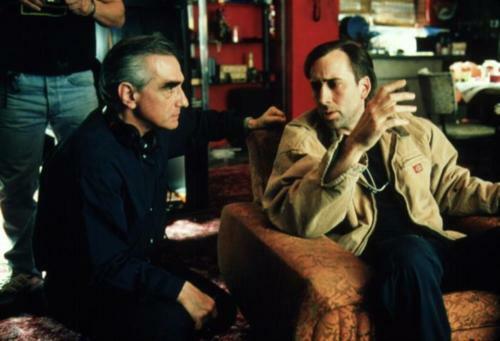 In the mid-to-late 1990’s, director Martin Scorsese would find himself here on several occasions, summoned from his bed in the wee hours of the morning to bear witness– first to the passing of his father Charles, and then to his mother Catherine. He no doubt perceived the emergency room as a limbo made manifest on earth—a stopgap between the living and the dead. It’s an admittedly easy allusion to make, and one that’s been made by many others, like New York City parademic-turned-novelist Joe Connelly, who’s book “Bringing Out The Dead” was sent to Scorsese’s attention by producer Scott Rudin. It didn’t take long for Scorsese to make the connect with his own life, but it would be a different kind of connection that proved more compelling: the perspective of a lonely, haunted man who roams New York City’s nocturnal city streets and bears witness to the gamut of human experience was the purview of 1976’s TAXI DRIVER, and the subject matter of BRINGING OUT THE DEAD (1999) would serve as a return to that world and emotional state. To this end, Scorsese sought out a fourth collaboration with his TAXI DRIVER, RAGING BULL (1980) and THE LAST TEMPTATION OF CHRIST (1988) scribe, Paul Schrader. While the finished film (produced by Rudin and Scorsese’s producing partner Barbara De Fina) was not fated to replicate the financial or critical success of Scorsese and Schrader’s prior collaborations, BRINGING OUT THE DEAD excels at capturing a particular nihilistic sentiment commonly expressed as the new millennium approached, and today stands as an underrated gem within Scorsese’s sterling body of work. BRINGING OUT THE DEAD is set in the early 1990’s, shortly before Mayor Rudy Giuliani’s city-wide crackdown on crime and subsequent “Disney-fication” of Manhattan. The action takes place entirely in a Hell’s Kitchen as perceived through the eyes of paramedic Frank Pierce (Nicholas Cage), a graveyard-shift insomniac who becomes increasingly haunted by the spirits of those he was unable to save. One of those people in particular—a young homeless girl he only knows as “Rose”—pops up almost everywhere he looks, poking at the fringes of his conscience. On the night we meet Frank, he’s reached the end of his rope and is actively trying to get himself fired. He transports the victim of a massive heart attack back to the emergency room, thinking he just might have saved this one. The man fights for his life over the course of several days, during which Frank befriends the man’s daughter: a compassionate, but troubled woman named Mary (Patricia Arquette). As he steers his ambulance through the city’s rain-slicked streets, he and a revolving door of partners continue responding to calls. He begins to notice that his calls all have one thing in common—a potent new street drug named Red Death whose tentacles are seemingly branching out into the city’s every nook and cranny. As Frank follows the trail, his journey becomes a descent into an underworld of sickness and vice—and the only way back up into the light is the one thing constantly eluding him: self-redemption. Nicolas Cage is a loaded name in cinema these days— the internet loves him for his special brand of wild-eyed and bizarrely-toupee’d performance, but the pedigree of the films he has chosen to partake in recently are… dubious, at best. Thankfully, Scorsese recognizes Cage’s true strengths as an actor and puts them to sublime use in BRINGING OUT THE DEAD. Cage’s gaunt physicality and heavy eyes are perfect at communicating a man who lives on the border between the living and the dead, acting as something of a ferryman at the river Styx. 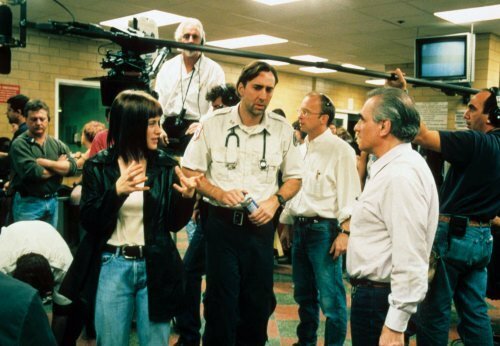 Patricia Arquette, at her prime here, plays Mary, a sinner whose hidden compassion is brought out by Cage. She comes to be seen in his eyes as a saint, and a path to salvation from of his own emotional purgatory. John Goodman, Ving Rhames, and Tom Sizemore appear as Cage’s revolving door of paramedic partners, each with his own particular quirks and sensibilities. Goodman plays Larry, a boisterously jovial man with his wits still lodged firmly on the ground. Rhames plays Marcus, a suave and charismatic con man with a fondness for taking his tentpole-revivalist preaching and sermonizing out in the streets. Sizemore plays Tom, a ticking time bomb of pent-up aggression and machismo. Additionally, BRINGING OUT THE DEAD contains a few notable cameos in the form of indie horror producer Larry Fessenden as a cokehead, future THE WIRE star Michael K Williams as a shot-up gangbanger, and Scorsese himself in voice form as the radio dispatch operator. After the dearth of familiar faces to be found in 1997’s KUNDUN, BRINGING OUT THE DEAD brings us back home to New York, where regular collaborators like cinematographer Robert Richardson and production designer Dante Ferretti are readily available. Filmed once again in the anamorphic 2.35:1 aspect ratio, BRINGING OUT THE DEAD is easily Scorsese’s grungiest, most-atmospheric film to date. The dawn of digital color correction technology at the turn of the millennium allows Scorsese and Richardson to boost the mood of their visuals after the fact, enhancing the film’s rain-slicked blacktops with glowing neon lights so as to resemble a scene out of Ridley Scott’s sci-fi dystopia BLADE RUNNER (albeit without the futuristic aspects). The contrast is stretched almost to a breaking point, where any hint of black falls right off into the abyss, and the color of white is so pure that it literally glows. The overall color palette deals in blues, greens, greys, and cyans (notably colder than Scorsese’s conventionally warm color aesthetic), which makes it all the more striking when the color red does show up. Like the lifeless cadavers he delivers to the emergency room, Frank Pierce’s world is one drained of color, and Scorsese’s strategic placement of reds cleverly conveys his transformation into a man rejuvenated by his experiences. There was a distinct sense of nihilism to be found as the twentieth century drew to a close. With the specter of Y2K looming large as an unknowable existential threat, the idea of the end of the world took on something of a begrudged acceptance in American culture. BRINGING OUT THE DEAD capitalizes on this sentiment, conjuring a tone that’s reminiscent of a cocaine addict’s fever dream, or as one critic puts it: “a methamphetamine jag”. Scorsese and his editing partner Thelma Schoonmaker take the template of TAXI DRIVER (lonely man watching city streets from his car, figures in the night obscured by expressionistic smoke and slow motion, etc.) and crank it into overdrive. Hopped on this anxious, jittery energy, Frank and his partners fly through the city like bats out of hell, accompanied by an eclectic chorus of blues, soul, reggae, and punk music (UB40’s “Red Red Wine” is particularly used to outstanding effect). BRINGING OUT THE DEAD is a fine return to form for Scorsese, the cinema’s great chronicler of New York City. Towards the end of the film, Patricia Arquette’s character proclaims, “this city will kill you if you’re not strong enough.” It’s a compelling conceit, one that echoes throughout several of Scorsese’s best works. Much like 1985’s farcical AFTER HOURS, BRINGING OUT THE DEAD revels in the collision of New York City’s various subcultures—Frank’s journeys take him all over town and into the homes, offices, and nightclubs of varying kinds of people. Scorsese’s New York City is one of great diversity, and BRINGING OUT THE DEAD uses the institution of emergency care as a lens to examine all the various walks of life the city has to offer. Finally, Scorsese’s long association with Roman Catholicism rears its head during a few scenes, when Frank and Mary talk about wanting to be priests and nuns. BRINGING OUT THE DEAD flopped at the box office, but critics found no shortage of things to like about Scorsese’s last feature of the twentieth century. While a cultural re-appraisal doesn’t yet seem to be in the cards for the near future, BRINGING OUT THE DEAD has a fair amount to offer in terms of signaling Scorsese’s development as an artist. The most visible example is Scorsese’s discovery of stylized color correction as a tool to convey mood and tone— a platform he’d build upon in later films like THE AVIATOR (2004) and SHUTTER ISLAND (2010). In returning to TAXI DRIVER’s sphere of influence, Scorsese’s fourth (and final) collaboration with Schrader doesn’t quite recapture the magic of that first effort. Instead, BRINGING OUT THE DEAD is an entirely different beast altogether, complete with a beating heart all its own. BRINGING OUT THE DEAD is currently available on standard definition DVD from Paramount.